Unlike my last blog post, where the recipe happened by accident, this one well, I have worked my way through and I am happy to say, I have come up with a version which sits well with the pallet, not to mention a family favourite. But it has taken time. 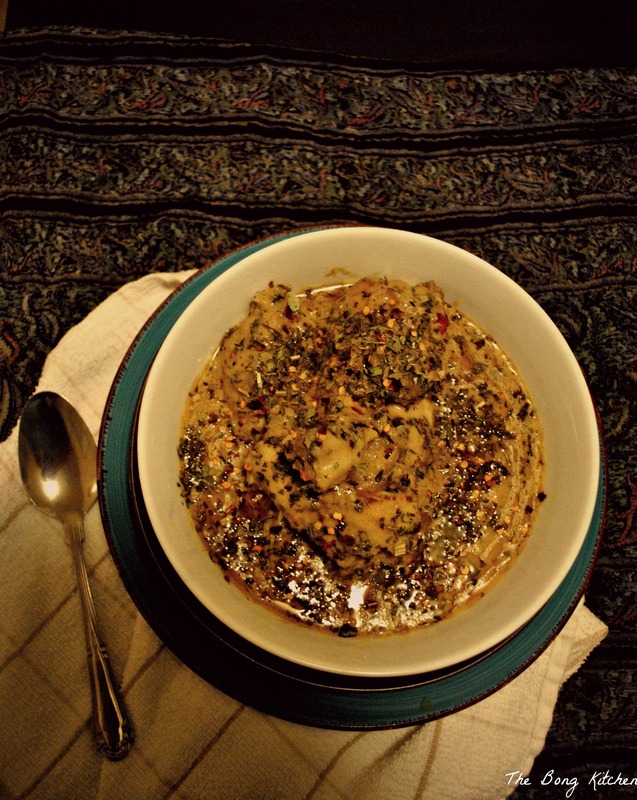 My first version of Dahi Methi murg was a disaster, too much methi, the curry went bitter, and the curry was too runny. Next time, I got the fenugreek leaves right, but sadly, the yogurt turned out to be a tad too sour and there was the time when the yogurt curdled so you get the picture and I was almost resigned to the fact that I will never be able to make Dahi methi Murg. 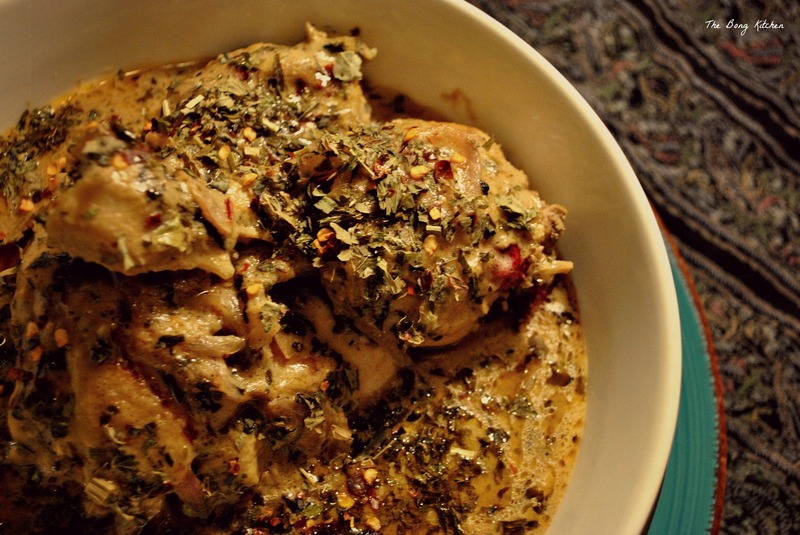 Honestly, I was a bit ashamed to admit that I could not get this dish right, when my friends and fellow bloggers would come up with such splendor version of Dahi Methi Murg. However, cooking is all about patience and one of the cardinal steps to any recipe which my Mother told me was, If you put your heart into cooking the food and lace it with your patience and love, you will get it right sooner or later. When I was at the brink of giving up on getting the recipe right; I decided I will give it one last try, I mean how hard can it be, I have marked out all the errors in my previous experiments, so I should just make sure that I do not repeat them. But then, it did not happen so easily, It took another, three times precisely before I hit pay dirt. Funnily enough, it wasn’t that difficult. I am not saying that my recipe is perfect and I know there are probably many more versions of Dahi Methi Murg, I mean I know of so many, while I was scouting for the recipe online. They all looked wonderful but I wanted a recipe I could call mine so after much deliberation, I worked through this recipe and I was elated. The hard work, the innumerable experiments, the playing with the spices, it worked and the end result was something I was very proud of. The colour the texture sat just right with the dish. So moral of the story, patience, love labour and perseverance pays off, in some cases sooner in others a little later, but it does come through. Yogurt ( 1/3 cup of greek yougurt and 1 cup of plain yogurt) The Greek Yogurt balances the tartness of the plain yogurt. Start by washing the chicken pieces and make slits into the pieces. Next in a non reactive bowl take the chicken and add all the ingredients under marinade. Marinate the chicken for a good 2 hours atleast. I leave it for about 5-6 ours but if you are short of time atleast allow 2 hours for the chicken to rest before you cook. Take a deep wok/kadhai and heat the oil. Next add the whole spices and temper, once they start crackling and release the aroma add the onions and sugar. Saute the onions till they become soft and become caramalised. Now add the ginger and garlic paste saute for about 3-4 mins. 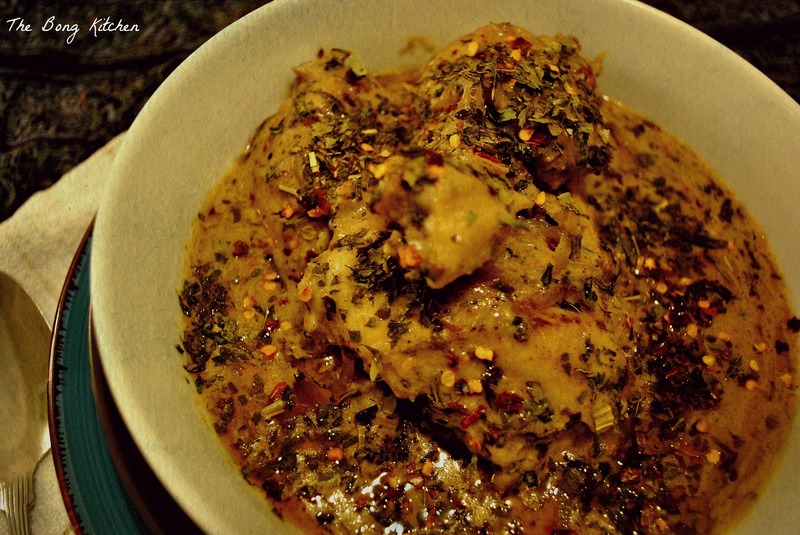 Take the chicken pieces and shake of the extra marinade and add it to the kadhai. Toss the chicken every 3-4 mins till they turn light brown on either sides, It takes bout 15-20 mins. This is called kosha or bhuna . If you are using fresh Fenugreek leaves, this is the time to add them. Now add the white pepper powder and the remaining yogurt marinade. To prevent the yogurt from breaking add one teaspoon of gram flour to the marinade along with 2 cups of water. Also add the dry fenugreek leaves or Kasuri Methi and mix them well before adding to the wok. Cover the wok and simmer for about 8-10 mins. Just before finishing add the garam masala , ghee and chili flakes.